A 60-YEAR-OLD New Jersey woman has become the oldest in the United States to give birth to twins after delivering two sons. 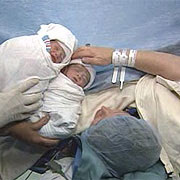 "Baby A" and "Baby B" were delivered by Caesarean section on Tuesday, weighing about 2.4 kilograms each, in Hackensack. "Age is being redefined all the time," the mother, Frieda Birnbaum, told a television reporter attending the birth. "I don't feel like 60. I don't know what 60 is supposed to be." Mrs Birnbaum, a psychologist, and her husband, Ken, a Manhattan lawyer, have been married for 38 years. They have three other children: two sons, aged 33 and 6, and a daughter, 29. Managing a pregnancy in a woman of Mrs Birnbaum's age was uncharted territory, said Dr Abdulla al-Khan, an obstetrician and director of perinatal diagnostics and therapeutics at Hackensack. 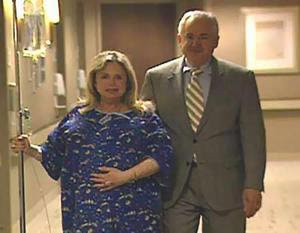 The twins were delivered at almost 36 weeks of gestation. They are expected to stay in the hospital for three days. Mrs Birnbaum underwent in-vitro fertilisation last year at a centre in Cape Town, South Africa, that specialises in older women. She said she wanted her youngest son to have siblings closer to his age, and wanted to remove some of the stigma in older women giving birth. The oldest woman in the world to give birth to twins is Carmen Bousada Lara, a Spanish woman who delivered twin boys last December, just one week shy of her 67th birthday.